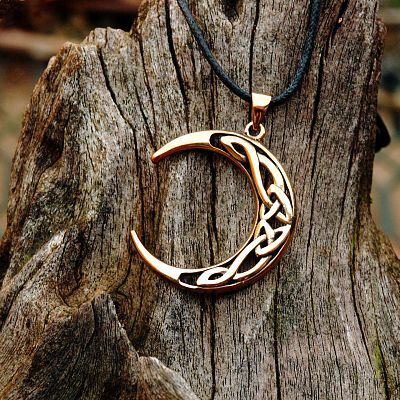 - An enchanting design, combining the symbolism of the crescent moon (new beginnings, fresh starts) with the deeper meaning of Celtic knotwork (interconnection, an unseen pattern that links each part to the Whole). Celtic Moon pendant measures 1 5/8" tall, including bail, and hangs from a 33" black cord. Made of bronze. 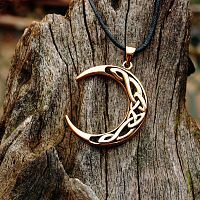 Do you have any other questions about our Bronze Celtic Moon Pendant? This is well made and a nice weight and size. It arrived quickly, too. It is bronze and will dull over time, but a polishing cloth shines it up very nicely in no time at all. 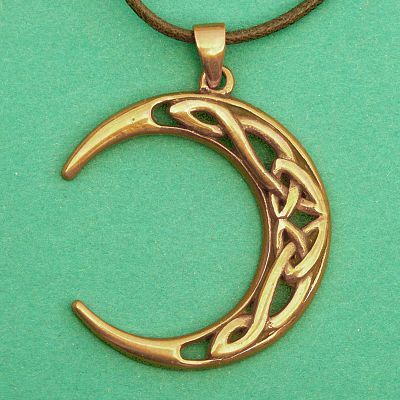 I bought these to go with the Celtic Teardrop Earrings.